News by Britta S., Lindsay M.
What’s with that semi-colon in the game title? Looks just like … of course, just like Steins;Gate. And there sure is a connection, for Chaos;Child is part of the Science Adventure Series, the visual novel series that also lays claim to Steins;Gate, quite possibly the best visual novel ever published. The story takes place in Shibuya, Tokyo, six years after an earthquake nearly destroyed the district. The protagonists are Takuru Miyashiro, a high school student who lost his parents in the earthquake, and his group of friends. Takuru also happens to be president of his school's newspaper club, and he notices that the dates of a spate of bizarre murder cases match up with a series of murders that happened six years before. As you’d expect, the investigation leads them deep into a dangerous murder mystery. The usual VN technique of player choices at certain points in the story is twisted in an interesting way, as Takuru has to decide whether to go with a positive or negative “delusion”, or neither. The story also contains some horror elements and is a direct sequel to 2008’s Chaos;Head. With a PEGI rating of 18, I am slightly nervous about its chances with the notoriously volatile Australian and New Zealand classification boards. Chaos;Child was originally released in December 2014 for the Xbox One in Japan, then later for PlayStation consoles, and finally for Windows and iOS. Fans of the Science Adventure Series have long clamoured for a localisation, and now publisher PQube has stepped in and is bringing 5pb’s game to North America and Europe for PlayStation 4 and PS Vita — in Q3 2017. The excruciatingly brief announcement trailer, above, gives us a glimpse of the promising visual style, and near the end we see the cryptic words “If you are God, and the delusion becomes reality. About what kind of the noids you get? Is it the sensual world? The despotic society? The destructive sanctions? Or …” This is exactly the same quote that was used back in 2008 for a trailer for Chaos;Head. While Chaos;Child may be a re-run of events very similar to Chaos;Head, the quote shows that the mystery endures. On May 25, NIS America hosted a special livestream for Ys VIII: Lacrimosa of Dana, playing through the Japanese PS4 demo to show off the battle system. It also dropped the news there and then that Falcom’s much-anticipated RPG will come to PlayStation 4 and PlayStation Vita, both physically and digitally, on September 12 in North America and September 15 in Europe, and in both regions on September 12 to PC via Steam. I don’t know about you, but I’m already clearing my gaming calendar for mid-September! Do watch the beautiful opening movie! This is the first new Ys adventure in 8 years — but some things, fortunately, just don’t change. Yep, Adol awakens, as customary, shipwrecked and stranded on a cursed island. He and the other passengers form a group to confront intimidating beasts and explore mysterious ruins. And Adol has a recurring dream of a blue-haired young woman living in an unknown world… Adol needs to unravel the riddle of the cursed isle and the blue-haired maiden - and yes, she’s called Dana, and she does get her own gameplay segments. Ys will bring its trademark lightning-fast combat, allowing you to switch characters on the fly. There also appears to be a village-building element to the story, with Adol rescuing those shipwrecked so they can provide valuable services to the group. Ys VIII will be the first game in the series to be localised not by XSEED but by NISA themselves. There has been some understandable concern over the continuity of excellence for the Western localisation, and NISA addressed many of the questions during the livestream. NISA senior associate producer Alan Costa stated that they “worked very hard to make sure that we are consistent between the previous games.” The Ys series commands a truly dedicated fanbase, and Costa added that they endeavoured to respect “what’s come before, while hopefully bringing it to a much broader range of people as well.” The game will include both English and Japanese voice-overs. Yet somehow one little triptych drawing has led to one North America and Australia’s favourite expos for all things gaming: Penny Arcade Expo, better known as PAX. There are currently a handful of events held annually under the title, spread across the two continents. PAX West is the “original” and located in Seattle, Washington. In America there are also PAX East (Boston), PAX South (San Antonio), and PAX Unplugged (a tabletop-focused even in Philadelphia). Australia gets PAX Australia, held this year in Melbourne at the end of October. There is also PAX Dev, which — exactly as promised — is for developers and also located in Seattle. This list of locales is decidedly steeped in Western culture, which is why I was tickled pink to hear that PAX is expanding into Asia. First stop? GC Play in Guangzhou, China from November 10-12. As the official site for Powered by PAX explains, “we've started looking around the world for events that believe what we do: that the community comes first, and if you start that way, good things follow.” While there is little else to go on, the site also promises that the same team working on the other worldwide events will be involved in the planning of this new extension, working with local teams to create an event true to the region. Guangzhou has a population of more than 13 million and is considered a major commercial hub. It is located within a province which, as a whole, is big on video games. XSEED seems to know just what we want to see from its upcoming title featuring the titillating women of Senran Kagura. The publisher has announced the "No Shirt, No Shoes, All Service" limited edition of Senran Kagura Peach Beach Splash, hitting retail stores this summer — how appropriate! The game puts water pistols in the hands of the Senran Kagura girls, something their evil-defeating ways have clearly prepared them for. 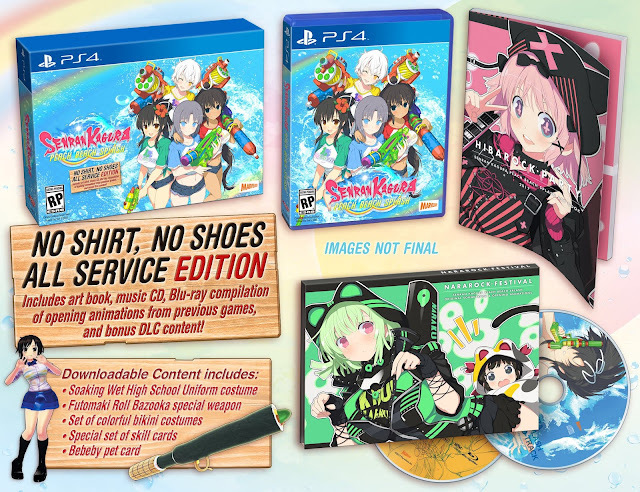 The limited edition includes a Blu-ray disc with a compilation of previous Senran Kagura games' opening animations, an art book featuring images of the girls' wet'n'wild summer adventures, a CD containing the game's soundtrack, and a DLC key. The key is key (sorry, I had to), as it will grant players the Soaking Wet High School Uniform, an entire set of colourful bikini costumes, a special weapon called the Futomaki Roll Bazooka, a Bebeby pet card, and a set of skill cards. Senran Kagura Peach Beach Splash is coming to PlayStation 4 sometime in the coming months. The game features over 30 girls with customizable weapons and abilities, ten water guns, and several combat arenas. There are also attribute cards that allow for improved weapons, unique skills, and pets! The limited edition will be the retail version of the game available as a physical item at release. It will be priced at $69.99 USD; the digital cost of the game is yet to be revealed, nor has the ESRB rating.